Today is a great day! For starters, it's Friday and who doesn't love Friday?! Second, it marks my 10th order on Etsy! Late last night, a beautiful and oh so smart soul purchased a print of "You are made of rainbows and perseverance." Messy hair and baggy eyes, don’t care! I was happy to take this sweet package to the post office today! So far, the majority of my orders have been direct through email, Instagram or Facebook and not through my little shop. My friends or friend's friends have all been so incredibly supportive and have kept me busy packaging prints or working on custom paintings. Because those orders have been keeping me pretty busy, I hadn't really put in a ton of time on my shop. I posted listings, but wasn't getting a ton of traffic. A couple of weeks ago I decided to investigate why my traffic numbers were so low. I quickly discovered that my SEO (Search Engine Optimization) was in pretty bad shape, so I spent a lot of time cleaning it up. You can have the best shop in the world, but if people can't find you - well, that's no fun. So I'm excited to celebrate this milestone, especially since it's largely due to my perseverance (see what I did there) and cleaning up those pesky keywords. There are SO MANY wonderful artists and makers in this world. And many of them are at various stages in their career. I thought it would be fun to highlight just a couple of my fellow artists. The shops below are owned and operated by people from all over the world but we are united in our love of color, and today - rainbows! First up, Efthimia who runs the darling Creative Prints Place. Photo and rights owned by CreativePrintsPlace. Efthimia is a graphic designer of 20+ years and lives in Rhodes, Greece. She has a great shop filled with bright and cheerful digital prints. 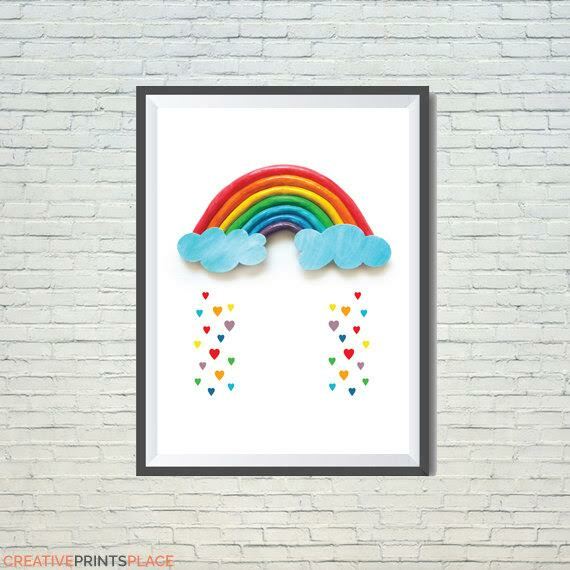 I love the 3-D look of this sweet rainbows and hearts print. She also makes really sweet paper mache items which can be found in her second Etsy Shop, Efthimia Paper Mache. Next up – Original Craft Addict, run by Jillian, Ben, Jake and Alexis. Photo respectfully borrowed from OriginalCraftAddict. I have been an admirer of string art for a long time, and this piece is just beautiful. I love the different textures in each layer of the rainbow. These guys sell both kits and original pieces and are based out of Las Vegas, Nevada. They also have a great website, so be sure to check them out either there or on their Etsy shop. Third on my brightly colored list today is a beautiful abstract piece by Dawn Young of DawnYoungArt. Photo respectfully borrowed from DawnYoungArt. Isn't this just gorgeous? I am in love with the brightness and textures of this piece. Dawn is from Abu Dhabi - a place that I have never been, but one I imagine to be very hot. Dawn specializes in abstract prints and party supplies and her work has a very soft beauty about it. Here's the link directly to the listing if you want to download this beauty. Her website explains her obsession with circles and the color blue. Last but certainly not least, is Megan Manske from Elk Grove Village, Illinois. Photo and work owned by MegDownTheRabbitHole. Megan is the owner of MegDownTheRabbitHole and creates beautiful mandelas and kaleidoscope prints. This one has so much detail in it - I don't know how she does it, but her work is beautiful. Have a favorite rainbow maker? Tell me about it in the comments.